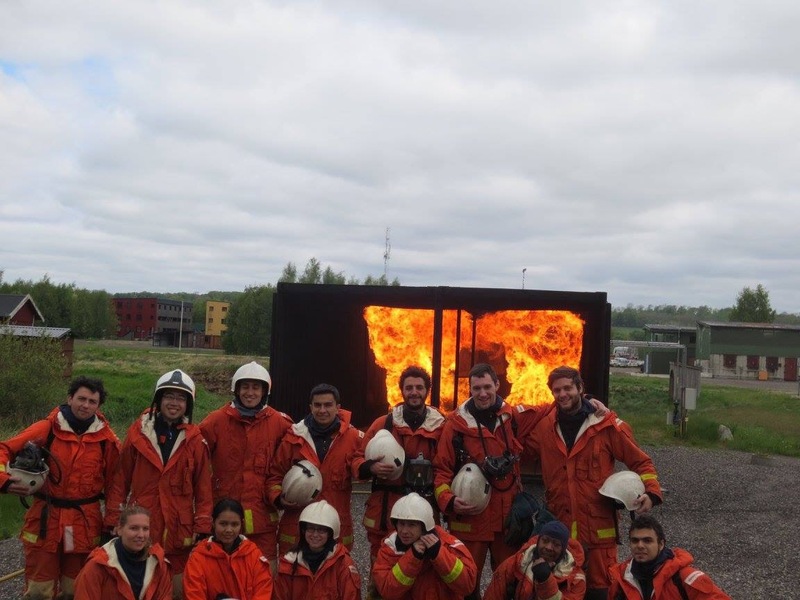 On Tuesday, all of us in our IMFSE class, including some Swedish students, went to the Fire Academy in Revinge, close to Lund. Everything was organized by our teacher Stefan Svensson. Although the departure was at 7:30, all of us managed to be at the meeting point on time. After our arrival to the Fire Academy and after all the presentations were finished, we all went to take our firefighting suits. This was the first challenge of the day since those sizes are different from the normal ones. After spending almost half an hour to get dressed up as firefighters, we had a tour through the whole academy and they showed us all the equipment that they have just for education. Honestly, their educational equipment are much better than all the ones I have seen so far. One of the firefighters taught us how to use all the equipment and how to wear it, so that we were ready to deal with the experiment we were going to take part of. We were divided into two different groups, each group had its own container and its own experiment. During our experiment, we saw how the fire behaves in a situation where the fire runs out of oxygen and how fast it’s growth is with oxygen supplied again. It caused nice flame jets over our heads. During the second experiment we felt and saw the behaviour of the fire and smoke in a closed container. We saw a phenomenon that we always studied, called pyrolysis, which means when the heat flux from the smoke is so high that it starts igniting other objects. Our suits could have been ignited as well and therefore after a while the heat flux was too much that we had to evacuate the container. After those experiments, we thought we could catch our breath. But another experiment was in front of us. Some of us, who felt like taking part of the experiment, had the possibility of extinguish a developed fire in an enclosure. It has been an amazing experience. In addition, we took this outstanding picture.